I started working on my first self-balancing robot during summer 2014. Since then I’ve been working on a second generation version of the robot, which includes some additional features. 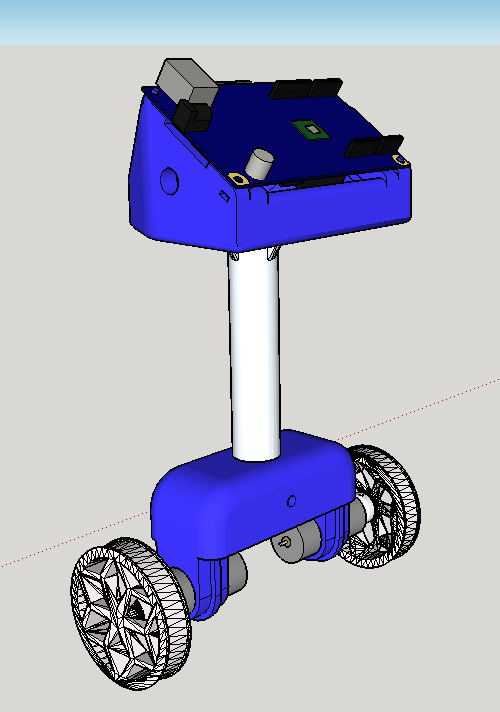 The 3D design for the top of the self-balancing robot. 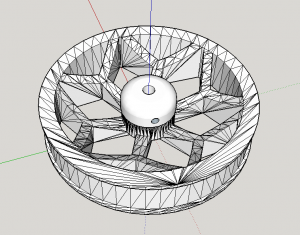 The 3D design for the base of the self-balancing robot. The 3D design for the central frame of the self-balancing robot. A 3D assembly of the self-balancing robot. Thanks for the project! I’m Brazilian, electrical engineering student, your project helped me a lot! Congratulacions! Hi!! Mr. Simon your Tutorial is awesome. In addition to your code, I want to print real time Pulse Width Modulation (PWM) of motors. So please suggest what I would have to do. Hi, printing out the real time PWM is really easy! Simply insert this line: Serial.println(PIDValue); into line 252 of my updated code here. Please note that printing to the console is very slow, and could affect the performance of the balancing system. I recommend you turn off any continuous serial outputs such as this once you are done debugging. I discuss some of the possibilities in my introduction post: http://wired.chillibasket.com/2014/09/self-balancing-robot-part-1/. To be honest, a simple two-wheeled self-balancing robot does not have many applications, but it is a fun robot to make and show off to your friends! The key is that the algorithms used in this project can be built upon and used in many different scenarios, such as bipedal robots, quad-copters, 3D printers etc. Can you tell the diameter of the motors ? I used motors with a diameter of 25mm and a total length of 70mm. You can essentially use any motors that you have lying around, as long as they draw no more than 12v, they are between 120-300RPM, and they have a relatively high torque. You can look at the first part of my Self-Balancing Robot Series to view all of the details about the components I used.